Bank of Maharashtra Recruitment 2017 Notification will be released soon. Interested candidates can check their Eligibility and then apply online for BOM Vacancies 2017. Aspirants can refer the Bank of Maharashtra Clerk, Probationary Officer, and Specialist Officer Vacancy Details. The Other information related to Bank of Maharashtra Careers like Age Limit, Educational Qualification, How to Apply, Application Fee, Process of Selection, Pay Scale, etc. are provided in this article. Know the complete details of Bank of Maharashtra Latest Vacancy 2017 like BOM Syllabus, Previous Papers, Admit Card, Answer Key, and Result from the following sections. As per the present situation, Jobs in Banking Sector is considered as the most encouraging and secure jobs in India. Most of the young Graduates opt for Bank Jobs as the sector has grown enormously. All of us know that securing a job in Government Sector has become a different task for each and every individual. Compared to Other Central Government Jobs like Staff Selection Commission and Railway Department, getting a job in Banking Sector is easier. So, aspirants are nowadays applying for Clerk, Probationary Officer, Specialist Officer, Part Time Sub Staff, Accountant, Field Officer, Marketing Executive etc. vacancies in various banks. The Eligibility Criteria for these Bank Jobs varies with Age Limit, Educational Qualification, and Nationality. The citizens who belong to Indian Nationality and those who fall under different categories are eligible to apply. The Age criteria are different for different posts. Coming to Clerk, the Minimum Age is 20 years and the maximum age limit must not be more than 28 years. For Bank of Maharashtra Vacancies 2017 Probationary Officer, the minimum age of the unreserved applicants must be 20 years while the maximum age should not exceed 30 years. Contenders must possess Degree or Graduation in any discipline in order to fulfill the Eligibility. The Clerk, PO, and SO Vacancies in BOM are filled through the assessment of contenders’ performance in Online Examination (Prelims & Mains), Group Discussion, and Personal Interview. Other details of Bank of Maharashtra Recruitment 2017 are provided below. All about Maharashtra Bank | Why Bank of Maharashtra? Bank of Maharashtra is one of the major Public Sector Banks in India. The Government of India holds its shares up to 81.61% of the total shares. BOM has more than 1868 branches across India consisting of 15 Million customers throughout the country. The bank has expanded rapidly after its nationalization in 1969. Candidates will experience many advantages if they get selected for Bank of Maharashtra Jobs 2017. It implements the growth oriented organization culture providing tremendous career growth opportunity. We have listed the benefits that an individual will experience after he/ she starts his/ her career with Bank of Maharashtra. It is the bank with many networks in Indian Financial Scene hub. In the recent years, BOM has been the fastest growing bank in India. Maharashtra is a Public Sector Bank with Pan India Presence which takes faster decisions. Bank of Maharashtra is under the efficient and prudent supervision of Reserve Bank of India. BOM provides the customized products and services. Recently, the Bank of Maharashtra (BOM) come out with a new notification for filling 110 Chartered Accountant, Engineer, Cheif Manager Vacancies. So, those people who are looking for the Bank Jobs can apply online for this Bank of Maharashtra Recruitment 2017 on or before 7th October 2017. But before applying, check the eligibility criteria once. The complete details of the BOM Recruitment 2017 for CA Posts are mentioned clearly in the below sections. Aspirants should possess Graduation/Engineering degree in the concerned field with min 60% marks from recognized board. For Chartered Accountant Posts – 21 to 35 Years. For Engineer Posts – 25 to 35 Years. Refer the BOM Notification 2017 for post wise age limitation and upper age relaxation details. For Chartered Accountants, the basic salary is Rs. 31,705/- to Rs. 45,950/- PM. For Civil / Electrical Engineering Jobs, the offered pay is Rs. 50,030/- to Rs. 60,820/- Per Month. General Category candidates – Rs.600/-. For Reserved category candidates – Rs.100/-. How to Apply for Bank of Maharashtra Recruitment 2017? Firstly, visit the official website i.e., www.bankofmaharashtra.in. Refer the eligibility instructions in the BOM CA Notification 2017. If eligible, fill the BOM Online Application form with the correct details. Upload the recent scanned photograph and signature. Then, pay the application fee through online. Finally, submit the application form and take one copy of it for future reference. 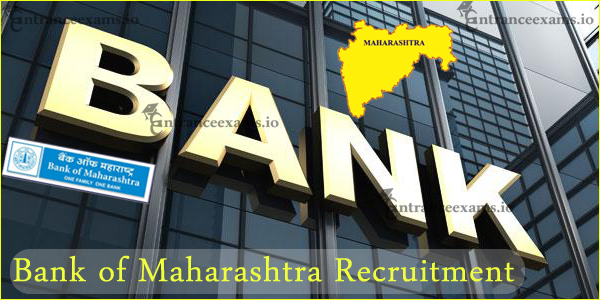 Every year, Maharashtra Bank will release the Notifications to take the career oriented aspirants for Probationary Officer, Clerk, and Specialist Officer Vacancies in BOM. Our team has given the complete details of Bank of Maharashtra Recruitment 2017 for Clerk PO SO in the below sections. Officials of BOM releases Bank of Maharashtra Notification 2017 for Probationary Officer every year for filling various posts that are left vacant. Probationary Officer Recruitment in Bank of Maharashtra 2017 is considered as the most prestigious opportunity for all the Job Seekers who wish to work in High Cadre. Are you one among the candidates who are aspiring to possess a designation of Probationary Officer? If so, then you are at the right place. Contenders must have passed Graduation in any discipline in order to apply for BOM Probationary Officer Jobs 2017. Applicants need to qualify in Prelims, Mains, Group Discussion, and Personal Interview to secure PO Job in Bank of Maharashtra. You can also go through the Bank of Maharashtra PO Syllabus 2017 for effective preparation. Bank of Maharashtra PO Exam Date 2017 will be updated on our site soon after the Official announcement. Are you an aspirant who are in search of Clerk Jobs in Bank? If your answer is yes, then you must have a look at the complete article. Contenders who fulfill the required Eligibility of Nationality, Age Limit, Educational Qualification can apply online for Bank of Maharashtra Clerk Recruitment 2017 from the Official website www.bankofmaharashtra.in. As there is tough competition for Bank of Maharashtra Clerk Jobs 2017, applicants must prepare a perfect preparation plan to crack the Exam. Candidates study the topics involved in the BOM Clerk Syllabus 2017 and practice the Previous Papers. Bank of Maharashtra will publish the Advertisement with a motto to provide employment opportunities to the jobless youth who possess Graduation as their qualification. As per the BOM Specialist Officer Jobs Notification 2017, applicants who satisfy the required Eligibility of Age Limit, Nationality, and Educational Qualification can only apply for Bank of Maharashtra SO Recruitment 2017. Individuals need to submit the BOM Specialist Officer Application Form 2017 prior to the last date. All the applicants need to prepare well with the help of Maharashtra Bank Specialist Officer Syllabus PDF and Previous Year Question Papers if they really want to become a SO in Maharashtra Bank. While appearing for any of the Exam organized by Bank of Maharashtra, individuals need to carry BOM Admit Card 2017 to the Test Venue. Contenders can find the activated link either from the Official website www.bankofmaharashtra.in or from the bottom of this page. Applicants must enter the credentials like Registration Number or Roll Number and Password or Date of Birth while downloading Maharashtra Bank Admit Card 2017. The following details are printed on the Bank of Maharashtra Hall Ticket 2017. Aspirants must have to carry some documents necessarily to the Exam Center. The Officials of Bank of Maharashtra will not allow the candidates to the Examination Hall if they do not take the BOM Hall Ticket 2017. Applicants can also carry any other proof for the purpose of identification other than that mentioned in the Admit Card of Bank of Maharashtra Recruitment 2017. How to download Maharashtra Bank Hall Ticket 2017? Candidates who have successfully applied for Bank of Maharashtra Recruitment 2017 need to have a look at the instructions given below in order to download Bank of Maharashtra Clerk Admit Card 2017. In the first step, aspirants should log on to Bank of Maharashtra Official website, i.e. www.bankofmaharashtra.in. Now, contenders need to go to the Recruitment Section. Candidates will notice a scrolling with name “Download Maharashtra Bank Call Letter 2017” in this Section. Then, applicants must click on that link and so, they will be asked to furnish some details like Registration Number or Roll Number and Date of Birth or Password. On entering the details carefully, the Hall Ticket of Bank of Maharashtra 2017 will be displayed on the computer screen. Aspirants need to download the Bank of Maharashtra 2017 Admit Card and take a print out of the same as it will be useful at the time of Exam. Have you attempted Bank of Maharashtra Clerk or Probationary Officer or Specialist Officer Exam? If so, then you may be eagerly waiting for the declaration of BOM Probationary Officer Result 2017. The Officials of Bank of Maharashtra has not released the Maharashtra Bank PO Result 2017 yet. We will intimate all the individuals who stay updated on our website regarding Bank of Maharashtra Probationary Officer Cut Off and Merit List. Contenders can check the outcome of their performance from the Official website, i.e. www.bankofmaharashtra.in. The following details are printed on the Bank of Maharashtra Recruitment 2017 Result Sheet. How to check Bank of Maharashtra Probationary Officer Result 2017? In the first step, applicants must log on to the Official website, i.e. www.bankofmaharashtra.in. or Click on the link placed at the bottom of this article. Individuals need to visit the Careers Section and then a new window will open. There, aspirants will find a scrolling of name “Check Bank of Maharashtra PO Results 2017”. By hitting that link, contenders will be taken to a page where they should disclose the details such as Roll Number or Registration Number and Date of Birth or Password. Candidates need to click on Submit button. Then, BOM Probationary Officer Results 2017 will display on the monitor screen. You can also download and take a print out of Bank of Maharashtra PO 2017 Results for future reference. Applicants can know the marks scored by them through Maharashtra Bank Probationary Officer Results 2017. Qualifying of the candidates does not amount to their selection. We will notify you the complete details about the further rounds. Therefore, individuals need to visit our site on a regular basis. Contenders who have any queries/ doubts about Bank of Maharashtra Recruitment 2017 must stay focused on our website entranceexams.io.